Move over quinoa, now there’s something healthier. Meet the new-old grain that’s taking over the ancient grains movement. It’s called “freekeh” (also spelled freekah or frike). I have been eating freekeh since I was a child, but has not become more mainstream until recently. While my friends were eating stuffing on Thanksgiving Day, my quirky Egyptian/Greek family was eating freekeh. Mom would cook it with rice, garlic, sage and currants, and then stuff it in the bird to soak in all its yummy oil and essence. While the turkey was barely touched, our family devoured the freekeh. When cooked properly, it is the most delicious whole grain you can taste. 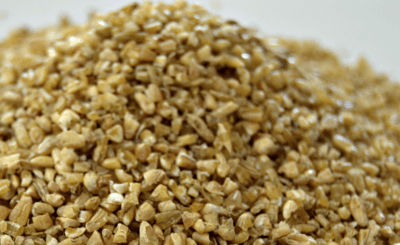 So what is freekeh? This strangely-named grain is a staple in ancient Egyptian and Mesopotamian cuisine. Thousands of year old hieroglyphics are drawn of farmers harvesting long wheat and cultivating freekeh. Today, it is used as a main food source in Egyptian, Lebanese, Jordanian, Palestinian and Arabian cuisine. Extracted from the young green wheat stalk, the green is then slow-roasted (either in the sun as they did in the ancient days or now in a factory), thereby giving it a smoky, nutty flavor. Freekeh resembles a slightly darker, crunchier and chewier brown rice. Half a dozen years ago, many were hailing “quinoa” as the new super-food from South America. Well, freekeh is even healthier (and, in my opinion), more substantial and delicious than quinoa. Cooked similarly to brown rice, this versatile grain can be used in replace of rice, quinoa, bulgur wheat, and oats. This is for a savory version of freekeh. Heat a frying pan over medium heat with some oil. Fry the onions until translucent. Add the garlic. Continue to stir until fragrant. Add the uncooked freekeh and slightly brown, approximately 1 minute. Add the water and salt to taste or broth. Bring to a boil. Cover and reduce heat to a low simmer for approximately 40 minutes. *Note: if using “cracked” freekeh, cooking time is reduced to only 25 minutes. Freekeh can be found at Harris Teeter’s, Whole Foods, Costco and any local Middle Eastern grocer. Ask someone to help you find it in the grains section. Uncooked, freekeh resembles a coarser, less uniform brown rice. It may be sold in bulk or prepackaged bags. Have you got any other great recipes for this old-now-new Super Food? I’d love to hear from you. Thanksgiving is right around the corner and I plan on stuffing our bird with freekeh. Discover your Inner Aphrodite . . .
Ring in the New Year with Pomegranates! Seriously.